For the 1954 steam locomotive of the same name, see BR Standard Class 8. 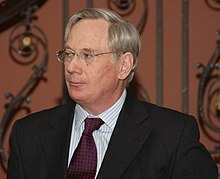 Duke of Gloucester (/ˈɡlɒstər/) is a British royal title (after Gloucester), often conferred on one of the sons of the reigning monarch. The first four creations were in the Peerage of England and the last in the Peerage of the United Kingdom; the current creation carries with it the subsidiary titles of Earl of Ulster and Baron Culloden. The title was first conferred on Thomas of Woodstock, the thirteenth child of King Edward III. The title became extinct at his death, as it did upon the death of the duke of the second creation, Humphrey of Lancaster, fourth son of King Henry IV. The title was next conferred on Richard, brother to King Edward IV. When Richard himself became king, the dukedom merged into the crown. After Richard's death, the title was considered ominous, since the first three such dukes had all died without issue to inherit their titles. The title was not awarded for over 150 years: the next to receive the dukedom was the son of King Charles I, Henry Stuart, upon whose death the title again became extinct. Prince William, son of the future Queen Anne, was styled "Duke of Gloucester" for his whole life (1689–1700), but was never formally created duke. Frederick, Prince of Wales, was styled "Duke of Gloucester" from 1718–1726, but was then created Duke of Edinburgh rather than of Gloucester. There was next a creation of a double dukedom (not two dukedoms) for the brother of King George III, Prince William Henry, his proper title becoming "Duke of Gloucester and Edinburgh". The fifth and most recent creation was for the Prince Henry, son of King George V. Upon Prince Henry's death, the dukedom was inherited by his son Prince Richard, who still holds the title. The heir to the title is Alexander Windsor, styled Earl of Ulster. The next in the line of succession is the Earl of Ulster's son Xan Windsor, known by his grandfather's third title of Lord Culloden. The royal dukedom will devolve into an ordinary one when inherited by Alexander Windsor; as a great-grandson of a sovereign he lacks any royal style. Therefore, he will be styled as His Grace The Duke of Gloucester. Thomas of Woodstock's son died two years after his father, but never succeeded to his titles except that of Earl of Buckingham. At the time of Thomas's death, he was regarded as a traitor and thus his titles were forfeit after his murder (except Earl of Buckingham). His son had no issue and his male line died out in 1399. Before marrying Humphrey, Eleanor de Cobham was his mistress. At the time of Humphrey's 1447 death, he had two children, Arthur and Antigone. However, both children were born before his marriage to Eleanor and were thus illegitimate and could not succeed to his titles. Richard succeeded as Richard III in 1483 upon his nephew's disappearance, and his titles merged with the crown. Prince Frederick became Duke of Edinburgh in 1726 and then Prince of Wales in 1729. Chisholm, Hugh, ed. (1911). "Gloucester, Earls and Dukes of" . Encyclopædia Britannica. 12 (11th ed.). Cambridge University Press. pp. 128–129.